There are always lessons to be learned from watching what goes on in other areas during crises. For the last several years Venezuela has been having food shortages, infrastructure problems and inflation. While this is an oil rich country, their socialistic economic policies have pushed them into a major food crisis. Yesterday I received some information on the current food crisis in Venezuela. Food is in short supply and very expensive when you can get it. Supermarkets are locked into a system that controls their sales. 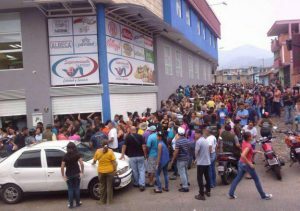 They are not permitted to sell Venezuelans food 15 days since their purchase of the same product. At the same time, prices are skyrocketing. Because people are hungry, they are starting to experience looting at shopping malls, pharmacies, supermarkets and food trucks. All the while people are chanting, “We are hungry”. Recently six Venezuelan members of the military were arrested for stealing goats, the Fort Manaure military base was out of food. Hunting dogs, cats and pigeons is common. Muchacho, Mayor of Chacao in Caracas, said “the streets of the capital of Venezuela are filled with people killing animals for food”. These are hungry Venezuelans protesting that their children are dying from lack of food and medicine and that they do not have enough water or electricity. The situation is now starting to turn violent with demonstrations and looting. This has resulted in some vigilante justice. An alleged thief in Caracas, Venezuela, was beaten up and burned alive in the street. People are eating anything that is edible including garbage and wild plants. During this type of situation a good food storage, knowledge of how to forage for wild foods and a good garden would make all the difference. But don’t forget you need to protect it from others. The best ways is to have it hidden and not to have to use violence. Learn from the example that we see occurring in other countries. But keep in mind cultural differences; on the whole the Venezuelans are not as spoiled as Americans and can probably handled their food crisis better than we would handle one. This entry was posted in food storage, Self sufficiency and tagged food crisis. Bookmark the permalink. Americans who have never been out of the country and have never e perienced a natural disaster, been in a war zone, or worked a foreign assistance mission in a developing country really haven’t a clue. Our urban poor live much better than others in Mexico, Brasil, the Phillipines, but the unfortunate overseas who make do without government handouts have stronger family values and work ethic, managing to build community without resorting to crime. I fear also that once the gravy train grinds to a halt, that Baltimore and katrina type chaos would be likely and may trigger government over reaction. I pray that I am wrong, and that Depression-era work ethic, self reliance, sense of community and family values still survive in the hearts of our people. I believe there are virtually no longer any “Depression-era work ethic, self reliance, sense of community, and family values” left in this country – maybe 10% of people; if that much. The vast majority of people expect the government to take care of them and many religious-types don’t prepare because ‘God will take care of them’. True story: Before I retired and moved to the ‘burbs, I had a large veggie garden – and was blessed with extreme surplus most years. Several years in a row I made the following offer through three local food pantries: If any of the pantry’s clients wanted to come out and pick the surplus veggies, they could have them free. Sounds like a simple deal; right? NO ONE ever showed up for veggies, but I did get several phone calls from people who’d ‘take the veggies off my hands if I would pick them and deliver them to the people’s houses’ !!! Will I feel sorry for those who will not prepare? The Ant and the Grasshopper, also known as The Grasshopper and the Ant or The Grasshopper and the Ants, is a fable attributed to Aesop, providing a moral lesson about hard work and preparation. In the numbering system established for Aesopic fables by B. E. Perry, it is number 373. The fable has been retold or adapted in a number of modern works. A modern satirical version of the story, in circulation since at least 2002, has the grasshopper calling a press conference at the beginning of the winter to complain about socio-economic inequity, and being given the ant’s house. This version was written in 1994 by Pittsburgh talk show guru, Jim Quinn. Conservative columnist Michelle Malkin also updated the story in connection with the proposed 2008 banking rescue package. Taxdn2poverty , yes, it’s good to prepare, but you cannot say the people are starving due to lack of food preparation. 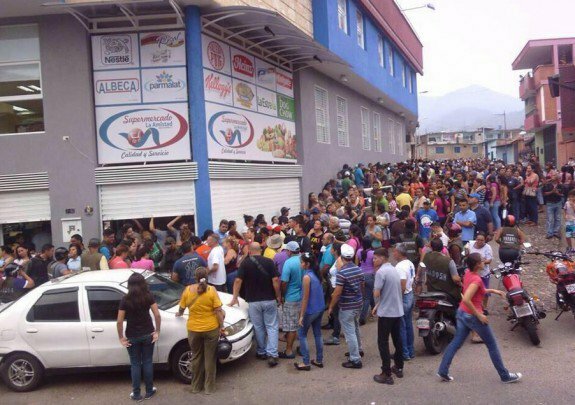 Even with a year’s supply of food, you would be in similar situations as the Venezuelan people find themselves today since their government started tracking and limiting its citizens’ purchases two years back. Your supplies would have quickly dwindled as well by now. Preparation includes rallying fellow citizens together instead of dividing ourselves with blaming and mistrust therefore allowing government to become too powerful. Interesting article on BBC which is a clear condemnation of government subsidies and price controls which led to a decline in domestic food production and dependence on imported food. Corruption has skyrocketed since the beginning of Venezuela’s “Bolivarian revolution.” According to the Cato Institute, $22.5 billion in public funds have been transferred from Venezuela to foreign accounts with no plausible explanation. Relatives of President Nicolas Maduro have been implicated in drug trafficking, with suspicions of drug money used to finance his campaign. Oh, and Venezuela’s capital has earned the distinction of being the murder capital of the world. All of these tragedies were avoidable… Chavez and Maduro kept saying that everything that was wrong with Venezuela was the fault of markets and that if the government either eliminated or regulated those markets, things would get better… their agenda… has been a disaster. This socialist brand of economic authoritarianism had the predictable consequence of political authoritarianism, corruption, and a breakdown of the rule of law. It’s a lesson worth remembering. Venezuela is imposing a new government food redistribution system in its capital, Caracas, that requires locals to acquire food from Socialist Party members, a move triggering national outrage as anti-socialist activists say the Party will use food to coerce citizens into supporting it.